I’m not April foolin’ when I say that when the grass flats start to ‘green up’ near Keaton Beach, the fishing there is hard to beat. It’s no secret that warm weather brings new life, especially in the form of spotted sea trout, to waters everywhere along our Big Bend. Unfortunately, that warmth can bring hordes (Or swarms, herds, gaggles or schools?) of eager anglers competing for the fish that come with the year’s fresh start, but not at isolated Keaton Beach and the inshore waters to its north along the Taylor County shoreline. Keaton Beach is about 20 miles southwest of Perry and 15 miles north of Steinhatchee, on what’s probably the most undeveloped stretch of coastline in Florida. The northern settlements at Dekle Beach, Adams Beach, Spring Warrior, and Econfina are small, and all have some amenities catering to visiting anglers. 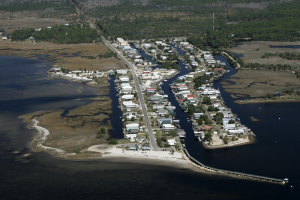 However, slightly larger Keaton Beach is the last place before St. Marks, 35 miles to the north, with a true deepwater channel that offers less treacherous access to the grass flats, as well as a full-service marina. 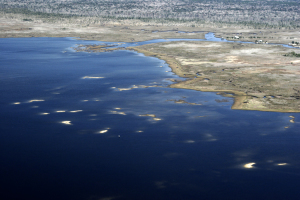 Scientists estimate that about a third of the Gulf of Mexico is comprised of ‘shallow and intertidal’ areas less than 60 feet in depth. 60 feet may be shallow to some folks, but Keaton Beach anglers think differently. You’ll be lucky to find more than 6 feet of depth within a mile or two of this rugged shoreline–to reach 60 feet, expect to head west about 35 miles! Shallow waters warm more rapidly than deep, and that warmth speeds the seasonal growth of sea grasses. Those grasses form lush flats, to the south and north of Keaton Beach, that attract bait and the spotted sea trout for which the place is famous. 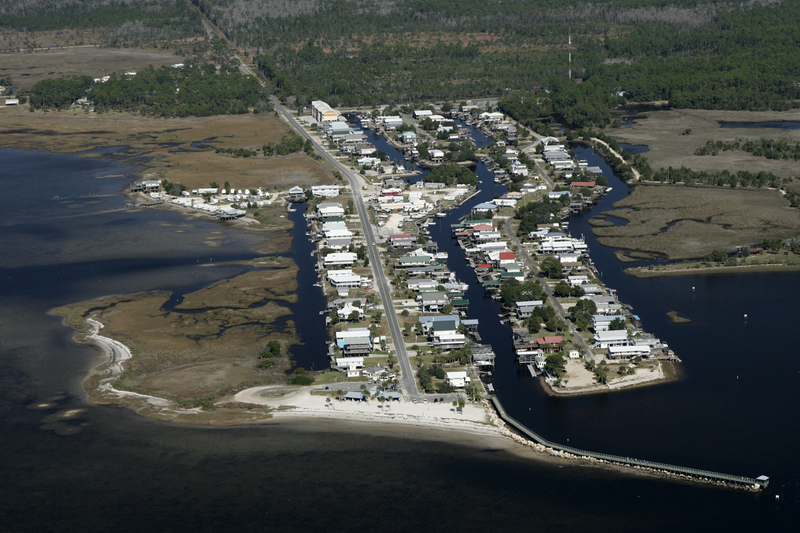 Taylor County’s Gulf shoreline is oriented northwest to southeast. No matter the direction you want to fish, I recommend you leave Keaton Beach by the main channel and go to marker #3 before you stray from its deeper water. Old bird racks (or places where they used to be) are good points of reference for navigating the shoreline here. Having waypoints for two of these are helpful and staying their distance off the shore will assure you’re in safer water. One, off Dekle Beach, to the north of Keaton Beach, is at N29 50.091 W83 38.643. The other, off Sponge Point, to the south, is at N29 47.076 W83 37.129. But if you’re familiar with the local waters, or you don’t value your outboard’s lower unit, you might cruise closer to shore. To the south of Keaton Beach, one fishing option is to concentrate on the flats that lie just offshore of Hagens Cove. 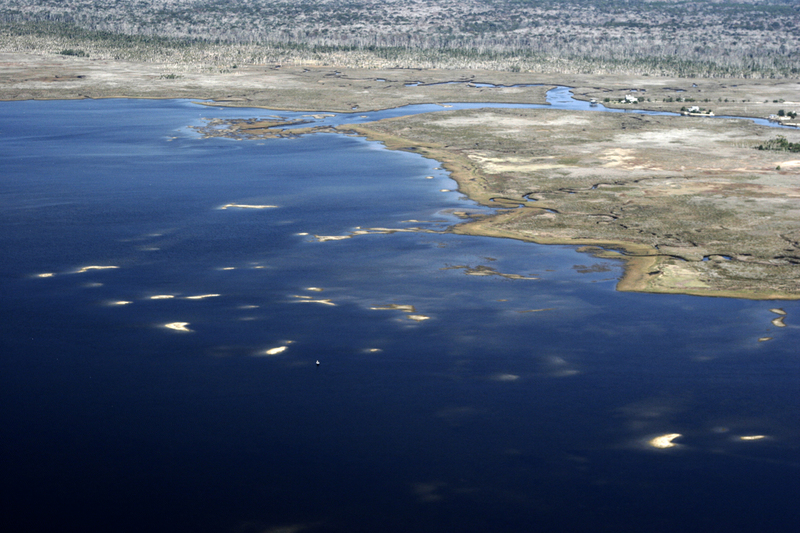 Use Piney Point (N29 45.588 W83 37.300) and Sponge Point (N29 47.053 W83 35.273) as shoreline references and drift the flats between the two, staying about 500 yards off the points. Another spot to try is the Dog Head area, about two miles off Hagens Cove (at approx. N29 44.900 W83 37.049). Here, the water’s a bit deeper, and depending on water temperature, may attract greater numbers of (but not necessarily bigger) trout. The 7 mile stretch of flats between Keaton Beach and Spring Warrior Creek (entrance at N29 55.286 W83 41.297) can be a lonesome place. If you’re accustomed to crowded flats in your home waters, you’ll be pleasantly surprised. Here, there’s plenty of room for everyone, and the word ‘everyone’ doesn’t necessarily mean a big number! Discovering exactly where to fish a new location can always involve some advance work with maps and tide tables, just guessing , or sneaking around and watching where the locals fish. Here, I’d skip the latter, not make guesses, and recommend you get your hands on a copy of Florida Sportsman’s Steinhatchee Fishing Chart (#020) and use it to carefully study the shoreline. A current tide table won’t hurt either. As waters warm seasonally, and tides fall daily, expect trout to move away from creeks and bars and spend their time feeding over grass. Two areas to consider are the notch between the two fingers of deeper water off Dekle Beach at N29 51.031 W83 39.547 or the trench off Spring Warrior at about N29 54.132 W83 41.482. Live shrimp, pinfish and GULP! shrimp are popular trout baits here, usually drift-fished under noisy popping corks, pinned onto 2/0 hooks or light jigs. No matter what bait you use, it’s important that you rig it to hold just above the grass tops. If you prefer fishing hard baits, you can’t beat a MirrOlure 52M or MirrOdine in bright colors. Jig fishermen are usually successful with soft plastics like D.O.A. CALs on quarter-ounce jig heads. I think spotted sea trout make the Keaton Beach area ‘famous’ because anglers can keep more of them than redfish. That doesn’t say much for conservation, and here, ‘catch-and-release’ is a new-fangled concept. But don’t let yourself believe that reds are by any means scarce. Reds won’t be as deep as trout and are more likely to hang around shell bars, like those close to shore south of Spring Warrior Creek. In these shallows reds can sometimes be very spooky and are prone to run from the splash of a cork or heavy bait, so try to get their attention with small topwater lures, gold spoons or lightweight D.O.A. 3-inch shrimp. And remember, you can only keep one! “I think spotted sea trout make the Keaton Beach area ‘famous’ because anglers can keep five times more of them than redfish.” Huh? Currently (2015)the daily bag limit for red drum is 2 per person in the northwest management zone and the daily bag limit for spotted seatrout is 5 per person in the northwest zone. So if you catch 1 keeper red and 5 keeper trout well then yeah you could say anglers can keep five time more specs than reds. But if you catch 2 keeper reds you better not get caught with 10 (5×2) keeper trout!